In February of 2019, the Trust for Public Land and the New York Bicycling Coalition released a report that maps-out a potential east-west multi-use trail across Long Island from Manhattan to Montauk, extending the Empire State Trail by 173 miles, thus allowing the trail to cross the entire state. Edgewood Oak Bush Plains Preserve. Photo via NY Dept. of Environmental Conservation. Currently, the Empire State Trail extends from Buffalo and Plattsburgh to the Battery in Manhattan for a total of 750 miles and will be completed in 2020. The trail does not currently include Long Island, whose dense population makes a route difficult but also ensures that any path would create significant health, economic, and social benefits. The study concluded that it is technically feasible to create a cross-island trail using a combination of 64 miles of on-road segments and 78 miles of off-road segments in Nassau and Suffolk Counties, with much of the off-road segments consisting of utility corridors for transmission lines that are already in the public domain and controlled by the Long Island Power Authority. The routes were selected with extensive input from Nassau and Suffolk County government officials, key business leaders, and biking and hiking clubs. The proposed trail will connect communities across Long Island and will improve the park access of many communities. It will also connect many of the isolated trail systems in Long Island’s excellent state and local parks, and intersect several north-south trails such as the Nassau-Suffolk Greenbelt Trail and the Long Island Greenbelt Trail, creating the potential for multi-day biking and hiking tourism, as well as a travel corridor for local everyday bicyclists and walkers. The estimated cost of the trail in Nassau and Suffolk Counties is $114 million. Funding from federal, state, and local sources is possible to cover these costs. Veterans’ Memorial at Eisenhower County Park. 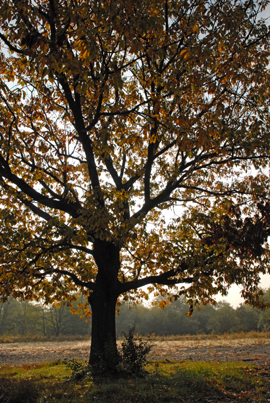 The report also identified a 21-mile pilot project spanning Nassau and Suffolk Counties, from Eisenhower County Park through Bethpage State Park to Edgewood Oak Bush Plains Preserve. It is estimated that phase of the project will cost $20 million, also with possible funding from federal, state and/or local sources. The 21-mile pilot trail will be a great recreational asset in its own right, connecting several parks and communities. But it will also be the first installment of the 173-mile Long Island Extension of the Empire State Trail. The report recommended the funding of a detailed existing condition study, route alignment, conceptual design, implementation plan, funding strategy, and public engagement for the pilot segment. The Trust for Public Land is a national organization that creates parks and protects land for people, ensuring healthy, livable communities for generations to come. Since 1972, The Trust for Public Land has preserved more than 3.5 million acres, created or transformed close to 2,000 parks, playgrounds, and gardens, and developed more than 2,000 miles of trails across the United States. The Trust for Public Land has also helped states and local communities generate over $74 billion in new public funds for parks and open space. The report was funded with the generous support of the New York State Conservation Partnership Program (an innovative public-private partnership between the New York State Department of Environmental Conservation and the Land Trust Alliance’s New York Program), the Long Island Community Foundation, and the Rauch Foundation. “I am thrilled at the progress being made to extend the Empire State Trail across Long Island. This trail will be an important asset for tourists, local recreational cyclists and commuters alike, helping to provide a new, healthy transportation alternative while celebrating the unique geology of ‘fish-shape Paumanok,’” said Suffolk County Executive Steve Bellone. “When taken together with the efforts of the many individuals and organizations who have worked to preserve and extend trail systems on Long Island, as well as Suffolk County’s upcoming county-wide Hike-Bike Network Study to improve infrastructure for pedestrians and cyclists across the region, the Empire State Trail will help advance our goal of putting a high-quality hiking and biking facility within easy reach of every home in Suffolk County,” he added. The New York Bicycling Coalition is a statewide non-profit 501(c)3 organization based in Albany that was founded in 1990. Its mission is to promote healthy, environmentally sustainable, and community-friendly active transportation through advocacy and education. 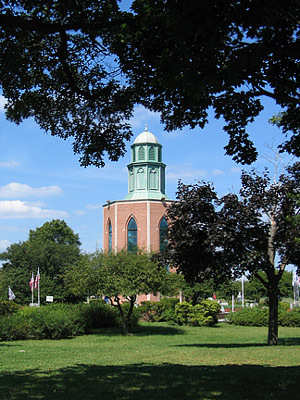 NYBC has an active network of supporters and contacts, in and outside government and at the grassroots level throughout New York State, including a longstanding presence on Long Island in both Nassau and Suffolk Counties. “The New York Bicycling Coalition is thrilled to be part of this phase one feasibility study led by the Trust For Public Land,” said Paul Winkeller, Executive Director of the New York Bicycling Coalition. “This proposal has a realistic on and off-road alignment identified through Nassau and Suffolk Counties, and its connection to the current beginning point of the Empire State Trail will make it a truly cross-state route. We’re looking forward to the day when a truly end-to-end linear park and travel corridor is in place to serve all the residents of New York State. At the same time it will become a truly global tourism destination,” he concluded. 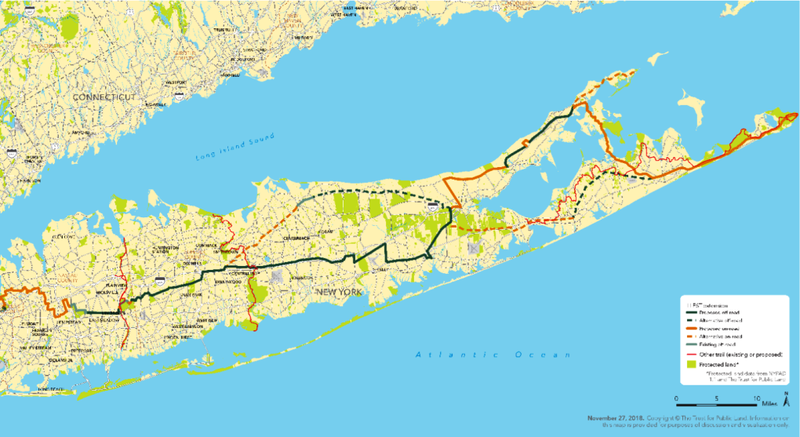 Featured image shows a map of the proposed 173-mile Long Island Trail, focused on the 142 miles of the trail in Nassau and Suffolk Counties. See complete report on the Long Island Extension to the Empire State Trail.